Brandi was a preschool teacher for 17 years before deciding to follow her passion for Dog Training in 2012. 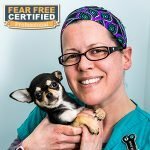 She earned a Certificate in Dog Training through the Animal Behavior College, and has also been certified through the Council for Professional Dog Trainers (CPDT-KA) in September of 2015. In July of 2015 she left the world of preschool teaching to begin a new career in Veterinary Medicine. She is currently working towards earning a Veterinary Assistant Certification through Animal Behavior College. Brandi is excited to continue to learn and grow in the Animal Behavior and Veterinary field in any way she can. She can be found throughout the hospital, always excited to see the unusual critter, and is not afraid to get her hands dirty. She is owned by a energetic Australian Cattle dog Kitt and adorable pint size Chihuahua Risa. In her free time she participates in dog sports with her Cattle dog, hiking, kayaking and yoga. Brandi is also the newest member of our team and we are so excited to have her working with us!